To the Rev. Dan Chun, senior pastor of First Presbyterian Church of Honolulu, it was nothing short of, well, a miracle. For years, Chun's church had been searching for a new, affordable location with adequate parking for its burgeoning congregation. And then, Chun told his congregation last month, it came to a church member one night in a dream. There was Chun preaching a sermon in an unlikely place: the clubhouse of Koolau Golf Course. Now, inspired by that dream, First Presbyterian is in talks with the golf course's owner, negotiating to acquire the 225-acre course and its clubhouse for about $20.5 million. The church hopes to renovate the 110,000-square foot clubhouse to include a sanctuary, offices, classrooms and dining areas. A source familiar with the deal said the church would keep the golf course and banquet facilities open for public use. Chun declined comment for this article, as did David Tongg, an attorney for the golf course's owner, Koolau Golf Partners LLC, which is controlled by a Hong Kong family. Despite the reticence among the principal parties, First Presbyterian has revealed its intentions on its Web site, which includes audio recordings of services during which Chun discusses the church's plans. Although the notion of a church on a golf course might seem unorthodox -- even for a denomination that shares golf's common Scottish ancestry -- Chun described it during a Nov. 6 service as providential. Four years ago, Chun said, the church's elders and long-range planning committee members were "literally ... on their knees" praying for divine help in solving their problem. Parking was becoming increasingly difficult, and with real estate prices soaring on Oahu, finding an affordable place was proving daunting, Chun said. The church looked at one site near Piikoi Street and Kapiolani Boulevard, Chun said, and the elders went so far as to take stones from the site in symbolic prayer that the church would find a new home some day, God willing. But the seller wanted $6 million an acre, so the church would have to pay about $36 million for the six acres that it needed for a new building and adequate parking. The church eventually raised $8 million, but that experience made it clear that finding a home in Honolulu would be next to impossible. "And then, by God's grace, somebody had a dream - and I found out last night two people had a dream -- of me preaching at a certain spot that wasn't for sale," Chun said. "And we checked it out, and lo and behold, to make a long story short, we talked to the owners, and so today I'm going to be announcing ... the site that we have chosen and we hope, by God's grace, we'll be moving to next year." 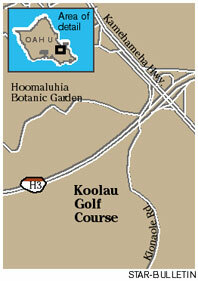 That site, he said, is the Koolau Golf Course. Chun went on to explain an attractive financial aspect of the deal: The church has an offer of about $15.6 million for its existing site. First Presbyterian is in talks with Catholic Charities Hawaii to sell the property on the corner of Keeaumoku and Nehoa streets. "At this time we have no comment; it's still under negotiation," said Stella Wong, vice president of programs for Catholic Charities Hawaii. With the sale of the property and the $8 million already raised, the church could buy the golf course for $20.5 million and still have "money left over for extensive remodeling inside" of the clubhouse, Chun said. "It's a real miracle," he concluded, before being drowned out by applause from the congregation. To be sure, not everyone agrees that it's a miracle. "I don't know that I would use that term," said Roy Savage, a church member. "But it's a smart move, a good move." Indeed, many church members appear less than enthusiastic about the proposal. On Nov. 20, when members voted for church leaders to move forward with the deal, about one third of the people voting were against it, said church member Roy Savage, who said the vote came out at 292 in favor of the move and 138 against it. Asked if this was a sign of a sharp rift within the congregation, Savage said, "It's less dramatic than that." Despite the opposition, the golf course site would appear to fulfill what the church set out to do when it began raising money for a new location earlier this year. According to the church's Web site, the church needs more space not just for parking, but also to host more than 400 events per month. Koolau has 365 parking spaces and could add another 135, bringing its total to 500. According to the church's Web site, it now has just 83 parking places, and with 1,200 members has even outgrown a parking lot that it rents on Sundays from Roosevelt High School. Although some have suggested the church address its need for space by spinning off smaller, satellite churches, leaders have said that First Presbyterian has better capacity to serve the community beyond the church's walls as a big church, with programs to help the poor, people who are recovering from divorce, mothers of preschoolers and active retirees. In any case, some church members view the golf course as their Promised Land. "We believe, like Abraham, that we're being led to a new home," long-time church member Lee Alden Johnson Chapman said during a Nov. 27 service. "We've been blessed in this home with much growth and enrichment, and we believe that if the move is God's will, that we'll also be blessed with growth in our new location."